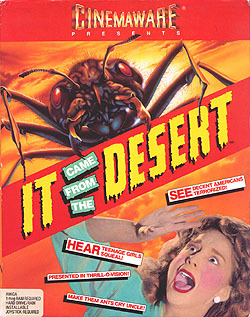 It Came from the Desert is an action-adventure game produced by Cinemaware in 1989. There is actually a parody/reference of this game in Space Quest IV, which can be seen in this video at about 20:00. Although rumored to have a lesbian character named Jackie (see here and here), based on our research it appears the example in question is the result of ambiguous use of the word “girlfriend.” Jackie is described in a walk-through for the game as “the daughter of Billy Bob and girlfriend of Max “The Enforcer” Cobb, whose affair was commented by tabloids. She was feared to testify against him so she took her friend Suzie and went to Lizard Breath” (It Came from the Desert walkthrough). As seen in this video of the game (and the screenshot below), the confusion likely arose because she keeps referring to her friend Suzie as her “girlfriend,” something that is common among platonic (heterosexual) female friends. If you have definitive evidence that this character is, in fact, an intentionally lesbian or bisexual character, please let us know.